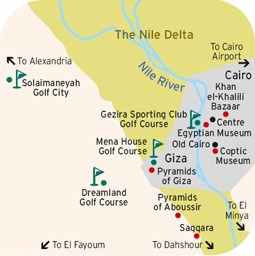 Katameya Heights was the standard bearer for Egypt’s new wave of golf development when it opened in 1997, 100 years after the first courses appeared. 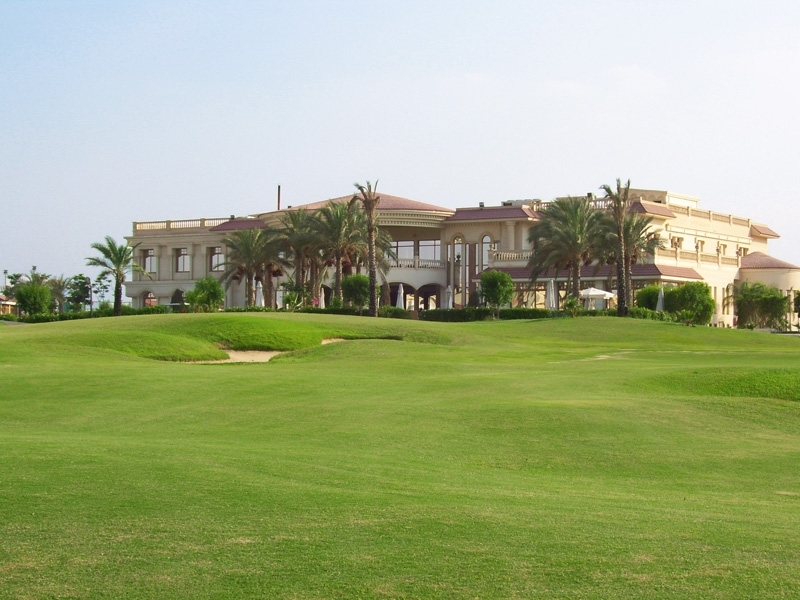 Laid out on hilly terrain on the south-eastern outskirts of Cairo with some dramatic elevation changes, it was also the first commercial development combining golf and real estate in Egypt and immediately set the benchmark in terms of quality with its Yves Bureau-designed course, elegant clubhouse, extensive leisure facilities and well-appointed villas. The Championship Course challenges all abilities, while the Nine-Hole Course better suits higher handicap golfers – although tricky bunkers, water and a 500-yard par-5 hole still provide a test. The undoubted star of the Championship Course is the signature hole, the par-5 15th, which provides sweeping views of Cairo. The landing area for tee shots is 40 metres below, where the fairway doglegs around a lake for a riskladen approach to the bunker-protected green. The hole forms part of a demanding finish to the course, coming after the long and difficult par-4 14th and leading into the hardest of its par-3 holes, a lake and out of bounds to avoid on the 17th and the challenge of the narrow, uphill 18th, on which pars are rare. Before your round, you can hone your skills with practice facilities including a 24-bay double-end driving range or get tuition from PGA professionals at the golf academy. It uses state-of-the-art video swing analysis, high-speed digital photography and detailed, on-screen graphics together as part of a coaching concept aimed at improving scores and players’ enjoyment of golf. Then after your round, enjoy a drink or meal in the clubhouse and sample its many facilities. For families, the dedicated children’s centre is a boon and includes a nursery. 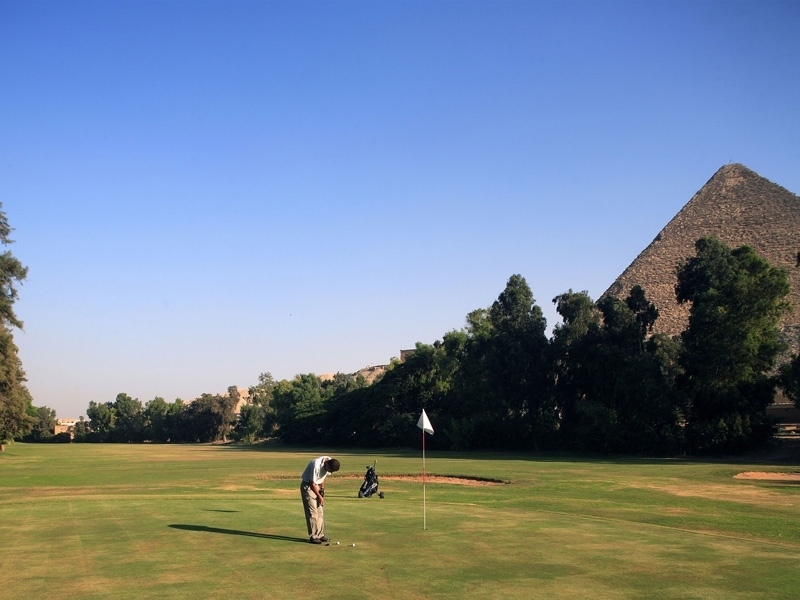 Set on an island in the middle of the Nile, Egypt’s oldest golf course is a green oasis right in the heart of Cairo. The Gezira Sporting Club was established by the British 125 years ago on 150 acres of botanical gardens on Zamalek Island previously established for ruler Khedive Ismail. Originally the golf course was an 18-hole layout inside a horse-racing track alongside polo fields, and the Gezira Sporting Club was the focal point for Cairo’s high society for 70 years. When land was needed for other facilities in the 1960s, the course was reduced to nine holes, but played as 18 holes with double greens and tees. 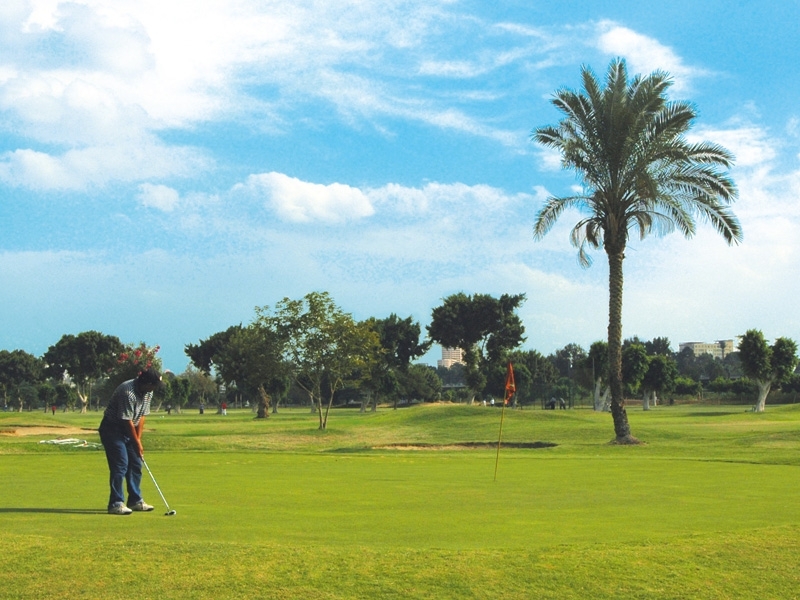 The course makes for a peaceful, serene escape from the hustle and bustle of Cairo for those who want to play a quick nine or 18 holes and it welcomes visiting golfers. The luxuriant shrubs all around this part of the island are a testament to its horticultural heritage. And while the mature trees on the course provide a pleasant green frame for the city’s skyline – dominated by the graceful, slender form of the 190m Cairo Tower – they can also present you with some challenging questions if you stray from the centre of the fairways. 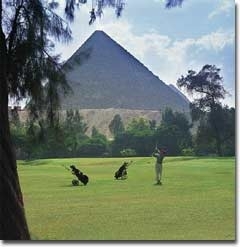 Even as a nine-hole course, Gezira is short by today’s standards,in common with its other venerable siblings in Egypt. However, it still manages to pack in three holes around or just over the 500-yard mark, to give six par-5s in an 18-hole round. 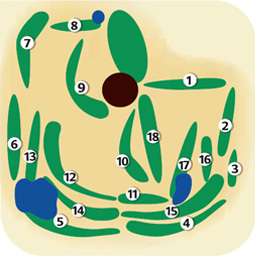 The remaining holes consist of two par-4s and four par-3s. 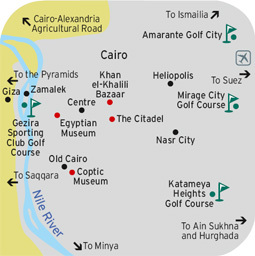 The course may not tax your golfing ability to the limit, but few capital cities in the world can claim to offer golf in such delightful settings and in such a central position, yet just a few minutes’ walk from a five-star hotel, the equally-historic Cairo Marriott, formerly a royal palace. One of the biggest golf resorts in the Middle East, the Pyramids Golf & Country Club serves up a feast of golf in a 2,000-acre landscape of lush fairways, trees, flowers and man-made lagoons 30 miles north of Cairo. 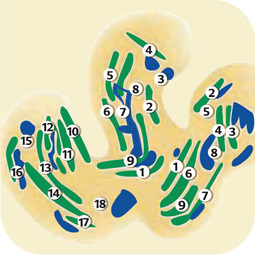 Three nine-hole loops form its South, West and East courses, giving 27 holes of progressively more difficult golf. The South Course offers a forgiving introduction with its wide fairways, friendly lakes and broad, undulating greens. This is your best opportunity for getting pars or birdies on your scorecard. The West and East nines comprise the Championship Course. For higher handicap players, the West Course is better combined with its easier companion, the South Course. More lakes step the degree of difficulty up a notch or two and demand greater accuracy of shots. The East Course presents the toughest challenge. Water comes into play from the 1st hole, a testing dogleg, while the par-5 7th is crossed by water no less than three times. Add narrow fairways to the mix, and it becomes a shot-maker’s delight. views. Perfect for unwinding after an energetic round. And if you stay for a meal, you can choose from Asian, French, Italian or Lebanese cuisine at Solaimaneyah Golf City, which also includes a hotel. From the pyramid-shaped tee markers to miniature obelisks bearing the yardage information and diagram for each hole, there is no mistaking where you are playing when you tee off at Dreamland, just 10 minutes from the Pyramids of Giza. If you need any further reminder, the Pyramids are visible from some holes of its newest addition, the nine-hole Pharoah Course. There is even a pharaonic touch to the names of holes on the new course, the opening hole naturally being called Ramses the First! 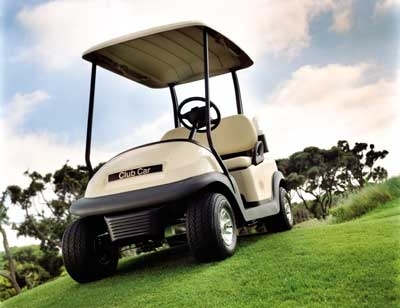 Whichever course you choose, the golf is fit for kings and queens. 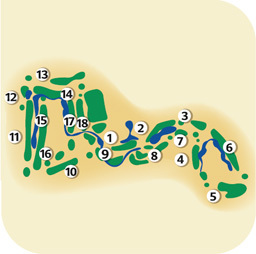 The Championship Course is among the longest in Egypt at over 7,200 yards, and can be played from four sets of tees not including the championship marks. Karl Litten’s design is tighter than it appears at first glance. Stands of trees and large waste sand areas planted with colourful shrubs separate the narrow fairways. 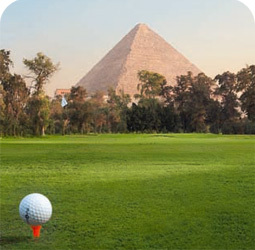 More challenges are provided by mounding and lakes, two of which provide grandstand finishes to the 9th and 18th holes, directly in front of the Hilton Pyramids hotel, which has rooms with balconies overlooking the course. The longest, and arguably the most scenic, hole is the 580-yard, par-5 6th, which doglegs left around an encroaching lake. One of the highlights of the Dreamland resort is its Indiana Jones-style clubhouse, complete with waterfalls, rocks, bridge with lashed-rope supports and a wooden terrace on stilts as well as a lounge and restaurant. Teaching is available from PGA pros at the on-course academy and there is a floodlit driving range for night use. Dreamland is a destination in its own right, being part of a 2,000-acre development incorporating the Dreampark amusement park and other leisure facilities plus shops and cinemas. The Hilton includes a pool with a swim-up bar, children’s club and spa. More hotels are being built alongside. Reach out and you almost feel as if you can touch the Pyramids as they tower above this, one of Egypt’s oldest courses. Nowhere else are you so close to the very fabric of the country’s ancient past than playing on the nine holes of the Mena House course, which is part of the luxury Mena House Oberoi hotel. First established over a century ago, the course can be played as 18 holes using the double tees and double greens on each hole. 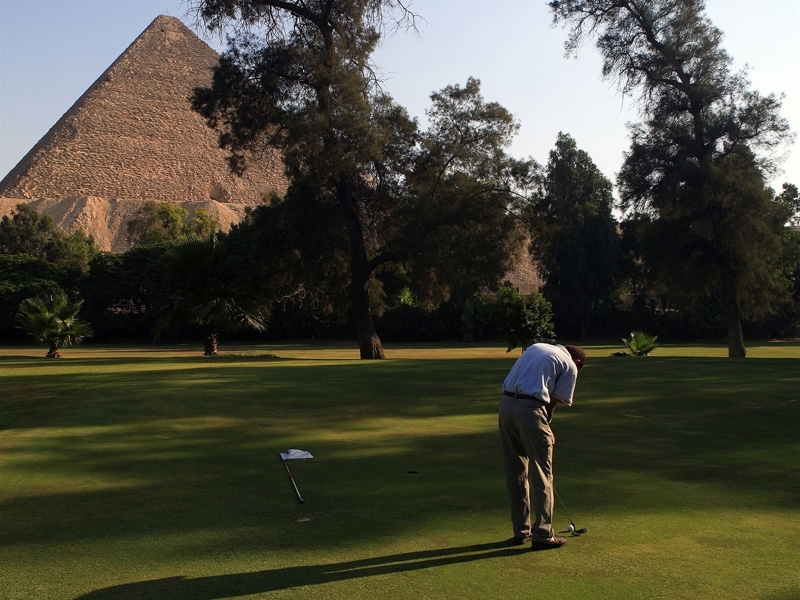 Major reconstruction work is expected to start during 2008 to transform and update the Mena House layout, an institution more than a golf course. The make-over, co-led by top golf architect Robert Trent Jones Jr, will take 12-14 months and will involve reshaping the course, removing some trees and extending two par-3 holes to par-4s, to take it to a par 70 from its present par 68. The new-look course will also feature three lakes, floodlighting, mounding, a new covering of Paspalum grass and automated irrigation. A new driving range and pool for hotel guests’ use are part of the redevelopment project, too. 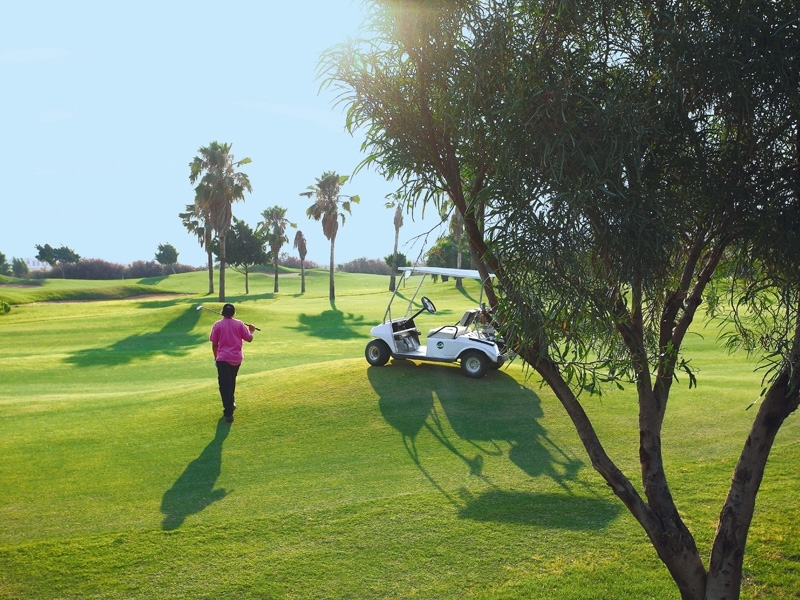 In the meantime, golfers can continue to enjoy an icon changed little since its early days, soaking up the atmospheric scenery as they putt or tee off in the shadow of the Pyramids. They can also dine in the course’s unassuming clubhouse restaurant while viewing one of the Seven Ancient Wonders of the World through the windows, the Great Pyramid of Cheops. There are more amazing views of the Pyramids from the Mena House Oberoi hotel itself, which sits in 40 acres of exotic jasmine-scented gardens. Cairo’s grand dame has played host to kings, emperors, presidents and celebrities for almost 140 years, a glorious history reflected in its antique furniture and rich, period décor. Lush fairways, exotic vegetation, serpentine lakes, waterfalls, ponds and gurgling streams belie the barren desert origin of this enchanting golf course by Swiss architect Peter Harradine, on the eastern outskirts of Cairo. If ever a course could claim to be a Garden of Eden, this must surely be it. There is even a themed water park boasting Cairo’s only beach at the five-star JW Marriott Cairo, which overlooks the first hole. Playing the 18-hole Championship Course, augmented since its opening in 1999 by an executive course, is a sensory experience. Not only does the course excite your sense of smell with the different fragrances of its flowers and trees, but it also harbours many visual delights. For their scenic glory, choose between the downhill, par-4 8th, with a spectacular view from the back tee, or the exquisite par-3 12th, a beauty with bite on which the green is edged on one side by a stone wall dripping with plants and on the other by a lake, as the signature hole for the course. But if it’s the challenge presented by a hole which merits the honour, look no further than the fiendish par-4 18th, its green perched imperiously on top of a steep slope which collects half-hearted approach shots and deposits them in a rock-lined stream at its base. 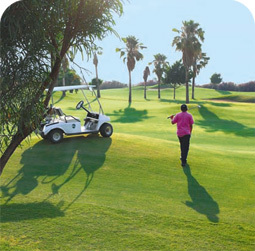 The course has four tee positions for regular play, making it eminently playable by all standards of golfer. Complementing the golf course is a palatial clubhouse complete with restaurant and sports bar, function rooms and a large terrace, as well as a golf academy with high-tech video training aids. Mirage City is just 10 minutes from Cairo’s international airport at Heliopolis, and free shuttles operate from the JW Marriott to downtown Cairo and the capital’s largest shopping mall, the City Stars Mall. 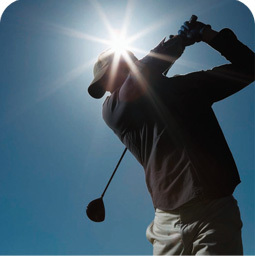 include a driving range which is floodlit for night use and a golf academy. Golf City also has three floodlit, clay surface tennis courts and a tennis pro.